Weekly Winner – Fried Rice with Potato Chips. What’s Not to Like? I’ve been flying solo this week at home which basically means, I can make whatever I want. And although I still try to be healthy, being by myself has always led to little culinary indulgences. No one’s around to catch me and The World’s Dorkiest Cat won’t tell on me because he knows there’s a few extra treats in the deal if he keeps quiet. My greatest junk food weakness has always been potato chips. I usually refuse to buy them because I simply cannot control myself. An open bag of chips is evil — it must be killed — and quickly! But what if it’s a required ingredient in a new, and for the most part, healthy recipe I’m going to try out?? Well then I have to buy it, right? I knew you’d understand. And yes, it is true that the recipe only calls for a half cup of chips. One of those small snack pack bags would have easily handled it. I just feel you can’t be too safe. You must be prepared. That’s all I’m saying. And the cat isn’t talking. 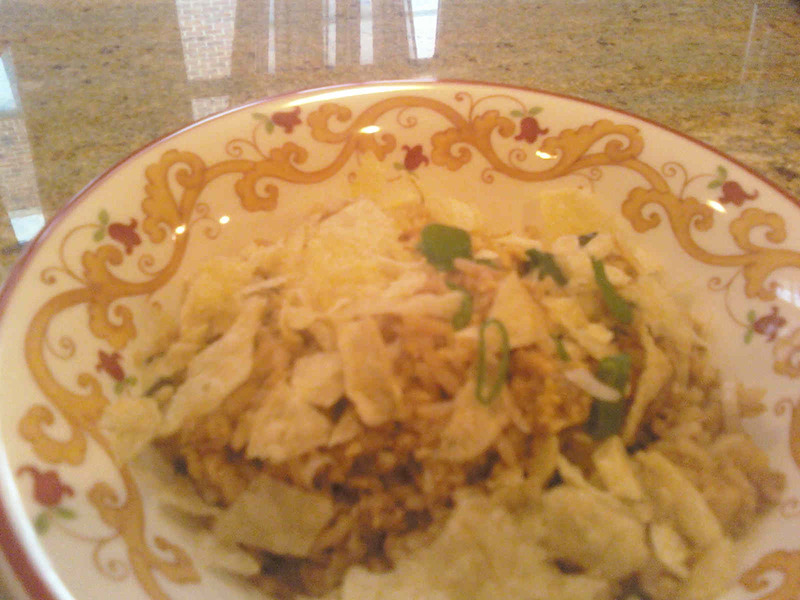 Without further ado, this week’s Weekly Winner is Turkey Fried Rice with Crushed Potato Chips from Food & Wine Magazine. It’s definitely a keeper. And did I mention the potato chips?? I was able to purge quite a lot of my chicken recipes this week. Basically, if it was a recipe for any kind of chicken on the grill, it was trashed. Once I discovered this week’s Weekly Winner – Cornell Chicken – there was no need for another recipe. This is the best. Ever. End of story. The recipe is from Cook’s Country Magazine and it was straightforward, easy and most of all perfectly delicious. And now I have lots of room in my chicken recipe binder for yet more experiments not done on the grill. For the Chicken: Whisk water, vinegar, and salt in a large bowl until salt dissolves. Add chicken and refrigerate, covered, for 1 to 2 hours. For the Seasoning and Sauce: Combine poultry seasoning, 2 teaspoons salt, and 2 teaspoons pepper in small bowl; set aside. Process vinegar, mustard, sage, rosemary, ½ teaspoon salt, and ½ teaspoon pepper in blender until smooth, about 1 minute. With blender running, slowly add oil until incorporated. Transfer vinegar sauce to small bowl and reserve for basting chicken in step 4. Heat all burners on high for 15 minutes, then turn all burners to medium-low (For charcoal grill, light 75 coals; when covered with fine gray ash, spread evenly over bottom of grill. Set cooking grate in place and heat covered, with lid vents open completely, for 5 minutes.) Scrape and oil cooking grate. Remove chicken from brine. Pat dry with paper towels and rub all over with poultry seasoning mixture. Arrange chicken skin side up on grill and baste with vinegar sauce. Grill, covered, until chicken is well browned on bottom and meat registers 120 degrees, 25-30 minutes, basting with sauce halfway through cooking. Flip chicken skin side down and baste with sauce. Continue to grill, covered, until skin is golden brown and crisp and thigh meat registers 170-175 degrees, 20-25 minutes longer. 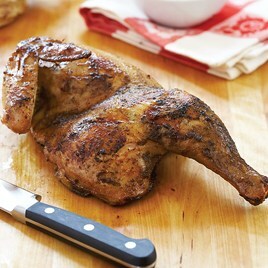 Transfer chicken to platter (do not cover) and let rest 5 minutes. Serve. It was a weird and wonderful week – food wise. So much so that I just couldn’t pick one Weekly Winner and present my first-ever tie. The first was a fabulous soup with two very unlikely ingredients: tomatoes and peanut butter. The result was a wonderful Thai-influenced soup with warm, cozy flavors and the perfect hint of heat. For the life of me, I can’t remember where I got the recipe so cannot give credit where credit is most-assuredly due. Heat the olive oil in a pot over medium-high heat. Add the onion, bell pepper and celery; cook, stirring, about 5 minutes. Add the garlic, curry powder, paprika, cayenne and 1 tsp salt; cook, stirring, 2 more minutes. Add the tomatoes, chicken broth, brown sugar and 1 cup water to the pot, then whisk in the peanut butter until incorporated. Bring to a boil, then reduce the heat and simmer gently, stirring occasionally, until the soup thickens slightly, about 30 minutes. Puree with an immersion blender or in a regular blender in batches. Season with salt and pepper. 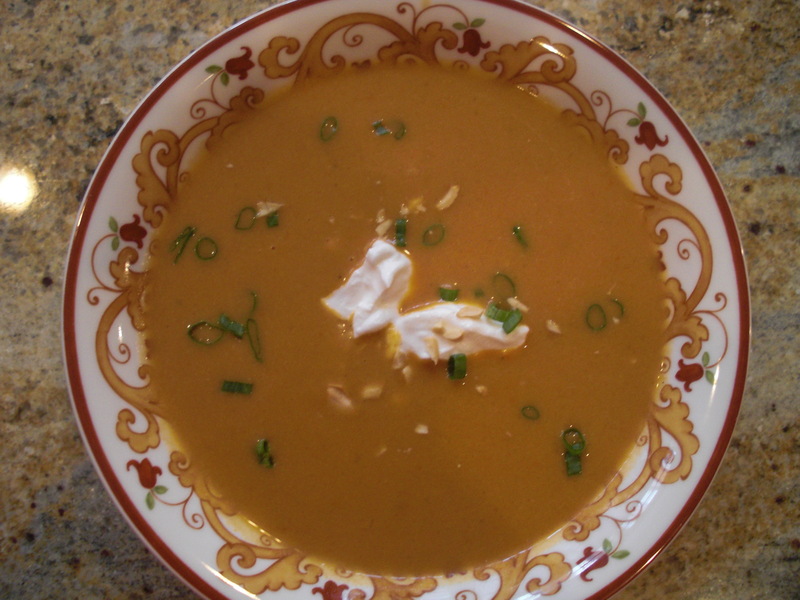 Ladle the soup into bowls; top with crème fraiche or sour cream, green onions, and chopped peanuts. Drizzle with olive oil. The co-winner this week was a very unique, almost tangy pasta dish which should be named “tipsy pasta” or “sloshed spaghetti”. 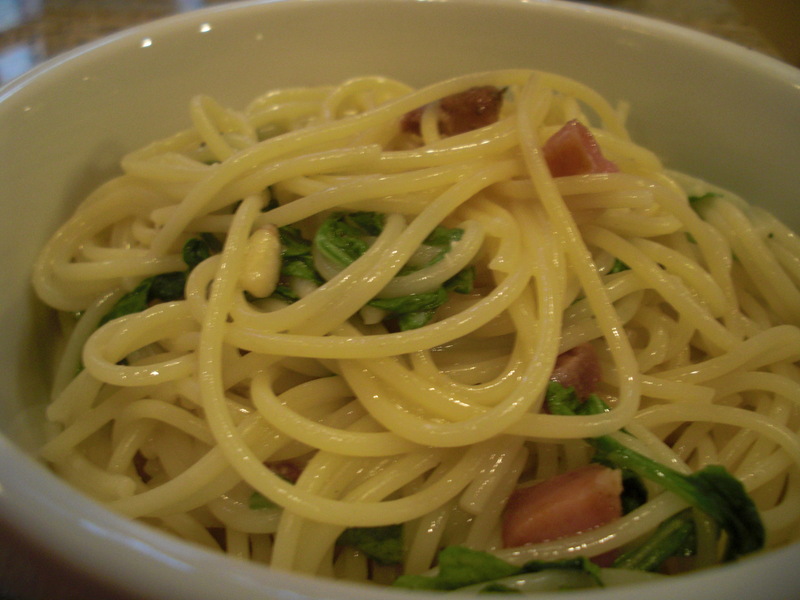 Instead, I simply present Spaghetti Al Vino Bianco. This recipe comes from Cook’s Illustrated. Trust me … make this dish. Heat oil and pancetta in 12-inch skillet over medium high heat; cook until pancetta is browned and crisp, 4 to 5 minutes. Using slotted spoon, transfer pancetta to paper towel-lined plate. Pour off and discard all but 2 Tbsp rendered fat from skillet. Return skillet to medium low heat and add garlic and pepper flakes. Cook, stirring frequently, until garlic begins to turn golden, 1 to 2 minutes. Carefully add 1-1/2 cups wine and increase heat to medium high. Cook until wine is reduced to ½ cup, 8 to 10 minutes. Add ½ tsp salt. Taste and if the wine reduction is too sharp, season to taste with up to 1 Tbsp of sugar, adding in 1 tsp increments. Bring 4 quarts water to boil in large pot. Add pasta and 1 Tbsp salt and cook, stirring often, until pasta is flexible but not fully cooked, about 4 minutes. Reserve 2 cups pasta water, and then drain pasta. Remove skillet from heat. Place arugula on top of spaghetti, pour ¼ cup Pecorino Romano; toss until sauce lightly coats pasta and arugula is evenly distributed. Season with salt and pepper to taste. Transfer to service platter and sprinkle with pancetta, remaining ¼ cup Pecorino Romano, and pine nuts. Serve immediately, passing extra cheese separately. Sometimes I make myself laugh … and not in a good way! This afternoon I had to go pick up a few things at the grocery store. Said store is a very quick half mile from the house. It is an absolutely beautiful day here today, so I decided I would walk. As I was getting ready to leave the house, I remembered I also had to go to the bank. The branch closest to the house is a little over a mile away, and in the same general direction as the grocery. But as soon as I remembered the bank errand, I was all set to grab my car keys and drive. On this glorious day! The truly crazy thing about this is that last weekend I walked a half marathon (13.1 miles for those of you who don’t know) and I had a very specific time goal in mind. Which, by the way, I beat. Yay me! However today, because I had to add an additional mile onto my errand walk, I was all set to jump in the car. Mind you, I had no time constraints, and no additional place to be at any specific time. It was simply habit. I laughed at myself as I headed out on foot for a truly lovely, leisurely walk to both the bank and grocery. Mission accomplished. It’s amazing how close things seem after walking a half marathon. Seriously … what was I thinking?? This afternoon as I stood in my kitchen with the door open and a warm humid breeze blowing through the house I remembered… yes indeed, it is the little things. I realize I’m showing my age with this song. But as I stood and enjoyed the warm, humid air wafting through the house while I prepared one of my favorite salads, I was truly happy. I like humidity, I admit it! I like to feel the air I’m breathing. Now of course, I can’t get the song out of my head! 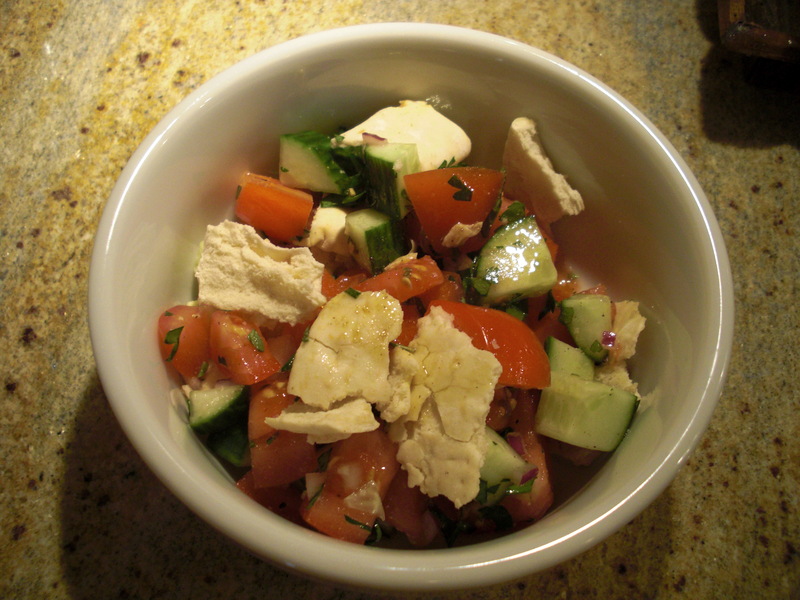 As for the salad it is a Toasted Pita Salad. I found the recipe years ago in Cooking Light magazine and it has always been one of my favorites.